A forage plant of the family leguminosce, and related to clover (trifolium) not only in its botanical characters but in its agricultural uses. The derivation of the word is obscure, but it is supposed by some to be from the Swiss canton of the same name; it is known in Spain as alfalfa, which name it bears also in Spanish American countries, and is still retained in California and New Mexico. 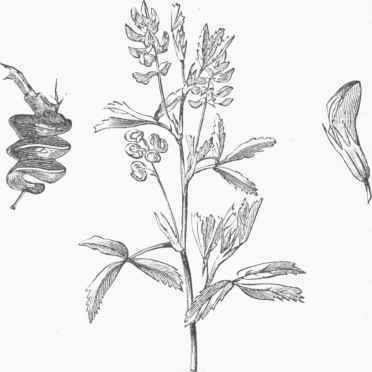 The root of lucern is perennial, from which arise erect, smooth, branching stems, 2 ft. or more high; the leaves are pin-nately trifoliolate, the leaflets obovate-oblong, toothed; the flowers, instead of being in a dense head as in clover, are in erect racemes; the corolla is violet-purple, and the many-seeded pod is spirally coiled. The generic name is from the Greek as it came to the Greeks from Media; it was probably cultivated several centuries before Christ, and came into European agriculture through the south of France and Spain. Lucern has never been much grown in England or in the older United States, but on the continent of Europe and in our far southern and western states it is regarded as of great value; its reputation on the Pacific coast has led agriculturists at the east to experiment with it, and it is likely to occupy a more prominent place in our agriculture than it has hitherto held. The experiments of Chancellor Livingston near the close of the last century called the attention bf farmers to lu-cern as a valuable forage plant, but our agriculture was not then sufficiently advanced to make its culture profitable; it is only where draining and improved tillage are practised that its value is manifest. The plant has very long roots, which have been known to penetrate to 12 ft. or more; hence it is quite unsuited to light thin soils with a poor subsoil. Another obstacle to its introduction is the care demanded by the young plants; the seed must be sown in'drills in well prepared soil, and the plants kept free from weeds until they have become thoroughly established; when the roots once get possession of the soil, they continue under favorable conditions to produce crops of herbage almost indefinitely. Like clover and other leguminous plants, it draws largely upon the atmosphere for its sustenance, and its wide-spreading roots in their decay enrich the soil with vegetable matter, while they at the same time mechanically disintegrate it. After a thorough preparation of the soil the seed is sown in drills from 18 to 30 in. apart; it should be cropped but lightly the first year, if at all; in its third year it is in full bearing, and may afterward yield from three to five crops each season. The cutting should be done as the plant is about to flower, and not be delayed until the stems become woody; it may be cured like clover, but its great value is as a soiling crop to feed in the fresh state to dairy cows and other animals; the yield in hay per acre is variously estimated at from three to eight tons. In California, where it is generally known as alfalfa, or Chilian clover, it is regarded as the mainstay of the stock raisers, and with irrigation it produces enormous crops. - Another Medica-go (M. lupulina), called black medick and nonsuch, a prostrate yellow-flowered species with black pods, is a common introduced plant in this country, and in England is regarded as a valuable sheep pasturage. The bur clover of California (M. denticulatd) is still another introduced species; in California it covers large tracts, and its bur-like pods remain upon the ground during the dry season, and afford a concentrated food to animals at a time when no green forage is to be obtained.